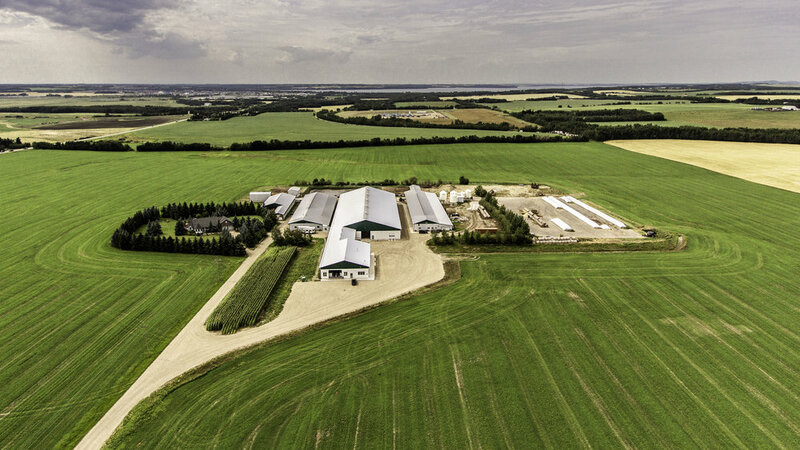 Farm photos were some of the first photos we did when we started Aerial Vantage Media. 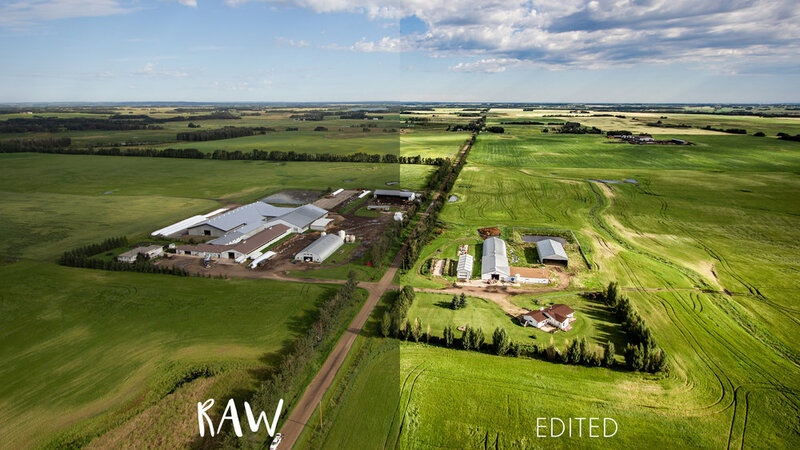 We have since done hundreds of farm photos across the prairie provinces and have extensive experience when it comes to rural aerial work. If your home or farm buildings are surrounded by large trees the long shadows may obscure much of your property. 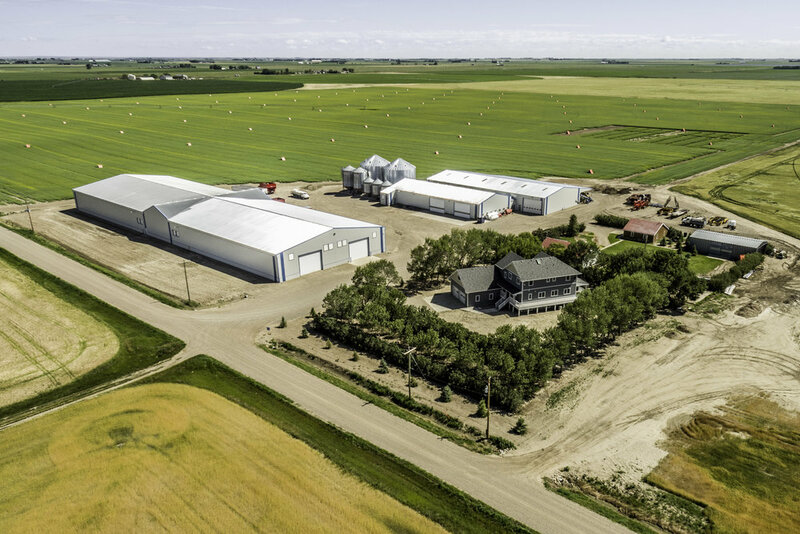 When you book us to shoot your farm or acreage we will "scout" the location via Google Maps and recommend a good time of day for us to complete the aerial shoot. Many people assume that they want their farm photos when all the fields are green and feel that this will look the best. Again, this is not always the case. Yes, it will usually look better than snowcovered fields, however when all the land surrounding your property is only green the photo can look quite "flat". Compare the two images below for example. The one surrounded by only green fields simply does not look as colorful and balanced as the one taken after harvest time when there is greater variance in field color. Often times our best farm and acreage photos are taken during the spring and fall months. In the spring there is a greater chance of having a great looking cloud-filled sky and during the fall season there is often a greater variety of color in the fields, trees and vegetation. What else goes into a great looking farm photo? A great edit. In order to preserve detail in both the highlights (typically tin barn roofs) and in the shadows (shade cast by buildings or trees) we always set our cameras to shoot RAW with a flat color profile. This provides us with significant latitude when editing and allows us to keep the photo looking clean and crisp (especially important when printing enlargements). As you can see, the differences are subtle, but important. A professional edit is especially crucial when you go to print your photos. One of our most popular farm photo prints is 12"x18". When enlarging photos to this size it is important that the image is sharp and noise-free (noise is the "graininess" photos have when improperly exposed in camera or when they are poorly edited) so that the printed work looks clean and crisp on your wall. We do all of our edits in-house to ensure consistent quality and use top of the line editing programs such as Adobe Lightroom and Adobe Photoshop. We also work with a number of photo labs across western Canada and only use ones that have consistently delivered quality prints time after time. Although we prefer to print the photos for our customers to ensure a quality photo, we can also recommend a reputable photo lab in your area should you prefer to print the photos yourself.